Viewing 13 of 13 items. 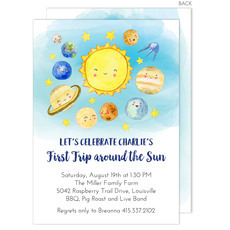 This set of adorable space themed birthday invitations will let your friends and family know the details of your child's upcoming party. Matching blank envelopes are included. Invitations come.. 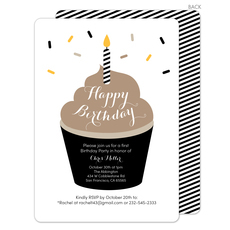 This set of adorable birthday invitations will let your friends and family know the details of your child's upcoming party. Matching blank envelopes are included. 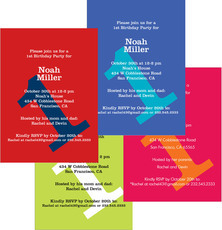 Invitations come with a full back.. 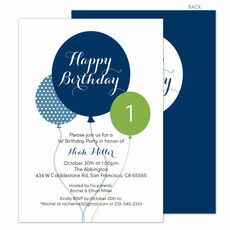 This set of birthday invitations will let your friends and family know the details of your child's upcoming party. Matching blank envelopes are included. 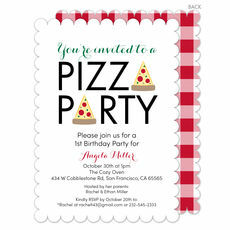 Invitations come with a full back design as..
Let friends and family know the details of your upcoming Pizza Party with this set of whimsical birthday invitations. Matching blank envelopes are included. 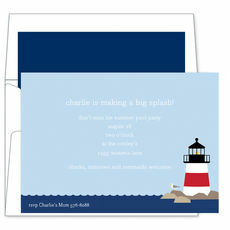 Invitations come with a full back design as..
Getting ready for your little boy's first birthday is an exciting event in your life that deserves a special celebration. Our boy's first birthday invitations allow you to add a personalized touch to this momentous occasion and invite all your special family and friends to help you celebrate in style. You can choose designs that allow you to upload photos you have taken over the past year. This is a fun way to showcase how your baby has grown and changed over the past 12 months. You'll be able to choose from stylish backgrounds and themes, such as bright or pastel stripes, birthday cakes or polka dots. In addition to selecting the colors, photos and graphics for these boy's first birthday invitations, you can also choose the shape of the card. Scalloped edges or medallion shapes set the tone for a playful party while a rectangular or curved edge is a classic choice. There are a variety of typefaces as well. A bold typeset gets people excited about the big event in your son's life while a curvy or stylized typesetting brings a touch of whimsy or elegance to the party. Once you've chosen the font, you can also pick the color of ink. Black, dark brown, blue, pink and many other shades are available. You'll dind that there is plenty of space to include all the details of the event. You can include information about the party's date, the location, the reason for the celebration, starting and ending times and how and when to respond. 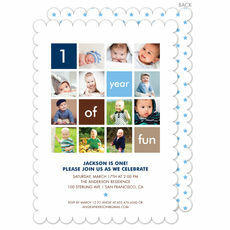 Designing your boy's first birthday invitations is one of the first steps in creating this fun and memorable event. Remember to save one of these special invitations in your baby's book so when he's older he can look back and see his special invitation. We also offer a large collection of party accents which are all personalized and can add a special touch. 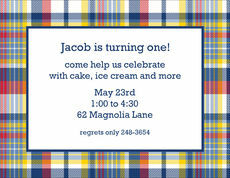 Consider personalized plastic plates, personalized napkins and more, to make your clean up a lot easier and to set the tone for their special birthday party.